This diagram is that of a 3 1/2″ vertical blind with standard features. Note its essential parts and names, as this is how they are most commonly known. sometimes called a track or header, is usually made of extruded aluminum, but can also be made of other types of metal, and even polymer material. Inside the headrail is grooved in such a way as to hold the traversing parts. Headrails can wear out, but it’s usually the other parts that fail over time. also called slats, louvers, or blades, are made of vinyl, or fabric. Vinyl vanes are most common these days as they can be made in a huge variety of textures, styles and colors. Fabric vanes are made with a sewn in weight on the bottom to keep them taught, but they can also be inserted into a channel panel, also known as a groover. Control ends enclose the string and chain. These do wear out as they have pulleys for the string and a gear for the chain, which can fail over time. The chain is what tilts the vanes back and forth and can be looped, or appear as 2 pieces hanging down, sometimes with tassels on the end. Control ends do wear out, and so does the string and chain. Although rare, the chain can break, especially if it’s yanked on too hard. The pull cord, or string, is what traverses the vanes back and forth in the headrail. Although it seems to be in a loop, it is just ties off inside the headrail in such a way so it never gets longer, but just ‘loops’ around as it moves the vanes. String does wear out, and can be replaced with a little effort and the proper instruction. Carriers are gear assemblies that traverse within the headrail. They hold the stem which attaches to the vane. The gears inside are what rotate the vane back and forth when the chain is pulled. They do break and very hard to replace for the average person. Especially considering finding the exact one for your particular headrail can be a daunting task, and also, if one has failed, it is likely that others are soon to follow. We recommend buying a new headrail when these start to go. The stem, as stated above, is what is integrated into the carrier. Stems also break and are only replace-able if they are not integrated into the carrier. Broken stems usually means it’s time to replace the headrail. Not pictured in this diagram example is a wand control. 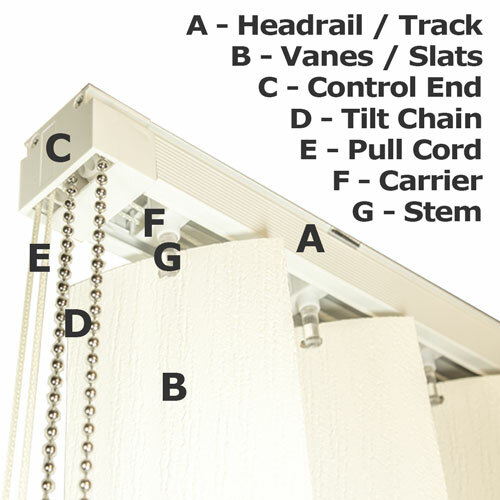 Wand control on a vertical blind replaces the control end, the pull cord, and the tilt chain. Wand controls are connected to the leading carrier and control both the traversing of the vanes, as well as the tilting of them. 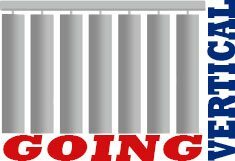 This entry was posted in Vertical Blind Components and tagged blind, components, headrail, mechanics, parts, schematic, slat, track, vane, vertical.